Classical Jazz: Violinist Sue Brown, a music instructor at Cabrillo College and UC-Santa Cruz, adds a classical touch to showcase performances of top jazz players as leader of the Monterey Jazz Festival Chamber Orchestra. Her latest collaboration is with trumpeter Roy Hargrove (right). THE MEMBERS OF THE Brown family, all gentle and soft-spoken, possess a remarkable intensity for music. As we sit down in the living room of their modest Santa Cruz home to chat about classical violinist Sue and jazzer husband Ray's work on jazz trumpeter Roy Hargrove's new album of ballads, daughter Karin--just graduated from the Juilliard School of Music--warms up on the violin in the next room. Even sounds echoing into the room from the backyard patio come on melodies from a boss blue jay musically declaring his dominance of the lawn and shrubs. When they take the stage with the Roy Hargrove Quintet in a showcase spot on Saturday's lineup at the Monterey Jazz Festival (Hargrove's Quintet will also perform Sept. 25 at Kuumbwa), most of the family will be there--Sue as concertmaster and coordinator of the Monterey Jazz Festival Chamber Orchestra; Karin in the violin section; Karin's new husband, Dan Levitov, with the cellos; and Ray conducting. It's a spotlight moment for Sue and Ray Brown. 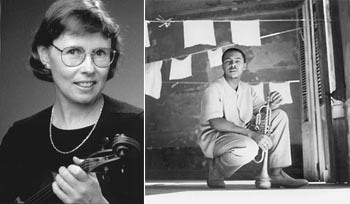 Both music teachers (at Cabrillo College and UC-Santa Cruz) and much in-demand in concert halls and onstage, the two are lynchpins of the Monterey Bay classical and jazz music scene, almost universally recognized by musicians and performers even if their modest demeanor and rare commitment to ensemble playing means that they have little audience recognition. With Moment to Monent, Hargrove's new album, though, they have ended up on one of the most high-profile jazz releases of the year, a landmark that critics have placed in a league with jazz classics like first-of-the-genre Bird With Strings or orchestral ballad albums by Clifford Brown and Chet Baker. It's an album, says Ray, that marks a return in mainstream jazz to standard repertoire and to a style of playing more concerned with melody and crisp, soulful phrasing than with experiments in form or harmony. "There's been a trend in the last five years to come back to standard tunes," he says. "This is, I think, a continuation of that. A lot of the tunes are old tunes--'You Go to My Head' and stuff like that. That was nice to hear--that these players can do a lot of things outside [of traditional jazz harmony], but they still seem to end up coming back to nice tunes." THOUGH RAY HAS performed, composed and arranged jazz for more than 30 years (as soloist for the Stan Kenton Orchestra, arranger for the Count Basie Orchestra and leader of his own group, the Great Big Band), it was Sue's connection with the Monterey Jazz Festival that first interested Hargrove's agent and manager in working with a Monterey Bay-based orchestra on a jazz-with-strings album. Sue had formed the Monterey Jazz Festival Chamber Orchestra for a 1994 festival performance with pianist Billy Childs, reconvening the performing group for a set at last year's festival with trumpeter Terrence Blanchard. "That was brass and strings, which was a very nice feel, and it was a nice set--a sharp show." Sue says. "Larry Clothier [Hargrove's manager and producer] had attended with great interest ... at least a three- or four-hour rehearsal. He was there the entire time, and he spoke with me about doing the album. At the time, not knowing who he was, I showed lukewarm interest. But Tim Jackson [Monterey Jazz Festival and Kuumbwa Jazz Center executive director] and a few other people said it was a great idea, and Larry was very persistent." From performing at Santa Cruz's Kuumbwa Jazz Center, the Monterey Jazz Festival, the Big Sur Jazz Festival and Big Sur's Esalen Institute, Hargrove and his band had developed a passion for the dramatic setting of the Central Coast. They decided that it would be the perfect spot to record an all-ballad effort--if major label Verve would sign on to release it. What sold the idea to label execs was finding that former Beach Boy Al Jardine had a well-appointed recording studio in the hills behind Pfeiffer State Beach and that the Monterey Jazz Festival had a capable chamber orchestra that could do the sessions. But with a recording date set for mid-October 1999, that left Sue Brown with only weeks to organize 20 top players who could commit to the gig. "What happened is when they got the OK from Verve, I had to scramble to get through working with a bunch of different unions and put the whole thing together--but we did it," she says. "To make it work, it was really an L.A.-type of union contract that we had to conform to our unique area, which is not used to doing major-label work. I hope to have more opportunities, though, because this is now an ongoing group that I've affiliated with the Monterey Jazz Festival." Ray explains that he got the call to conduct the recording session at the last minute. Ray's years-long association with session recording engineer Phil Edwards, who had engineered sessions Ray conducted for the Bay Area's Full Faith & Credit Big Band and Ray's own Great Big Band--not to mention Sue's lobbying to Hargrove's management, earned him the nod to lead the orchestra. "Sue was all set up but [Clothier] didn't know who he was going to use [to conduct the strings]," Ray says. "[Clothier] was thinking of Cedar Walton, because he wrote two of the tunes. Then Cedar had an illness in the family and couldn't leave Texas, so [Clothier] called me the night before ... and sent up with Tim [Jackson] the dub [of the tracks Hargrove's quartet had recorded so far] so, the night before, we could listen to what was going on." AS LEADER OF chamber music ensembles at Cabrillo College and UCSC, Sue is primarily a classical violinist. Though she occasionally crosses into jazz, as with a featured Kuumbwa performance with Ray's Great Big Band last November, she is careful to point out that she doesn't really play jazz. "Except when I took [Ray's brother] Steve Brown's improv class at Aspen--and they thought I was pretty cool--I know my limitations," she says. "I think Ray and I work on each other's strengths. I think I'd be too corny and I'd laugh too hard to play improvised solos. I think Ray would just laugh hysterically at me. That's not my thing." "I think that the best written stuff takes advantage of the way the strings play and doesn't put them out of their idiom," Ray adds. "The smart writer knows how to write strings and doesn't ask them to swing. Like [Gil] Goldstein on this album--he knows how to write them so that they're doing the things that they're normally doing, but it's put inside a jazz context and it sounds beautiful." The Monterey Jazz Festival Chamber Orchestra performs with the Roy Hargrove Quintet Saturday (Sept. 16) at 8pm and with the Wayne Shorter Group Sunday (Sept. 17) at 7:30pm on the mainstage at the Monterey Fairgrounds. The Festival runs Sept. 15-17. Call 925.275.9255. From the September 13-20, 2000 issue of Metro Santa Cruz.